I’m pretty excited to share this with you, but I have to warn you first. 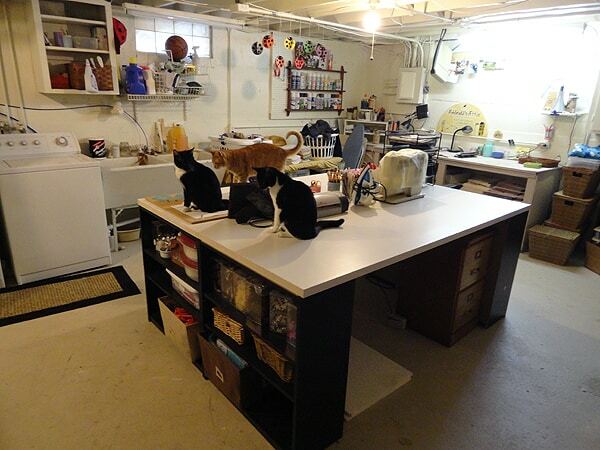 My craft room is in the basement. It’s not all glamourous and shiny like the ones you see featured in big magazines. It involves concrete walls, exposed plumbing, laundry machines and all the ugly things you find in a basement. It’s not pretty, but it’s a large space and a great place to keep my overwhelming amount of craft supplies contained. When we bought the house, we took a paint sprayer and 20 gallons of white paint to all the dingy walls. So it’s a far cry better than it was, but it’s still not pretty. So with that disclaimer out of the way, I bring you my great big wonderful craft table, complete with cork board and magnetic chalkboard! First I want to give credit to Amanda from The Ivy Cottage Blog for providing the inspiration (and instructions!) for my table. 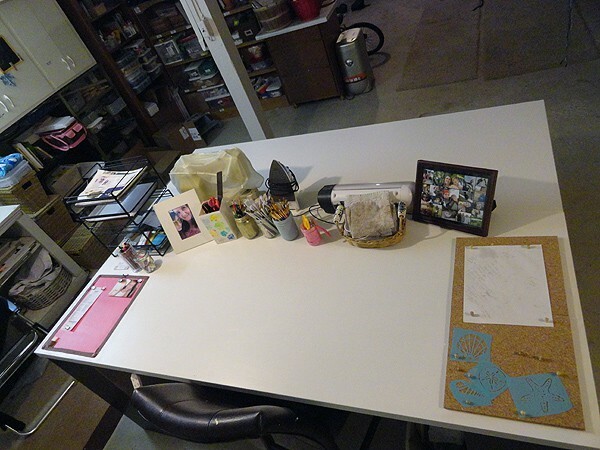 Her space (pictured below) is so much lovelier than mine, but we had several similarities with our “blank canvas” that I knew this was the table I wanted to create. You see, I’ve been pinning different craft room organization posts for a while now, saving them for inspiration for my craft room. When I pinned Amanda’s table I knew I was going to make it. I showed it to hubby and he was all for it. We had plenty of space downstairs for it, so we went to Walmart for the bookshelves (they only had black, $15.99 each x 4) and to Home Depot for the hollow core doors ($23.00 each). We bought L-brackets (total $6.96) to attach the tabletop to the bookcases and one-hole straps (pictured, I spent $1.08) to run cords through underneath the table. We also used mending plates (pictured, I spent $4.41) to secure the tabletops together from underneath. After priming and painting the doors, a coat of Minwax Polycrylic (pictured, $16.57) in satin finish was applied to protect the surface. Total spent, not including tax $138.98. I’m pretty flippin’ pleased to have been able to create my awesomely huge space for less than $150. Especially when Pottery Barn is charging $1100.00 for this one pictured above and it’s not near the space!! I definitely didn’t want cords all over the table top, so hubby drilled a hole in the middle and attached a power strip upside down under the table. This way all the cords go through the center and none of them will be stretched across the table top. That caused an issue for my glue gun though. Since the glue gun does not have an on/off switch, it can’t be left plugged in. So we used those one-hole straps I mentioned above to run a small extension cord through so that it pokes out under the table right where I work. There’s enough slack in the cord too so I can stretch the glue gun across the table and work with it from anywhere. I wanted to customize my table a bit too. First of all, I knew I wanted some cork board and magnet board. 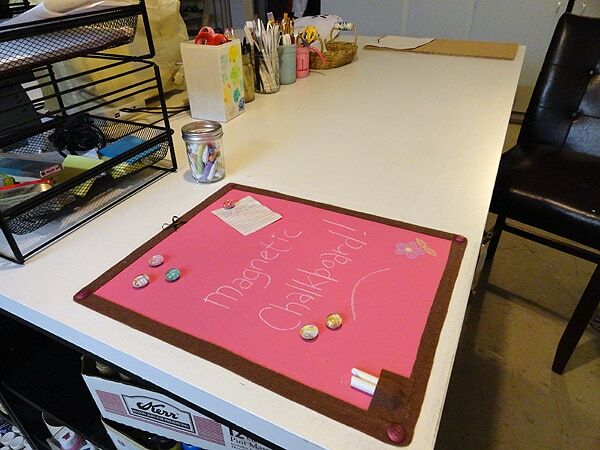 And I’ve always wanted to buy those chalk markers, so I decided to go with a magnetic chalkboard on the left side of the table (I’m a lefty) and a cork board on the right. These will keep my notes and sketches handy and secure while I’m working. I simply bought and used Rustoleum magnetic primer and Decoart’s pink chalkboard paint. I’m loving the chalkboard. My son writes me notes on it too haha. I just masked off an area with painter’s tape, sanded it, painted it with the magnetic primer, then used the chalkboard paint over the top. 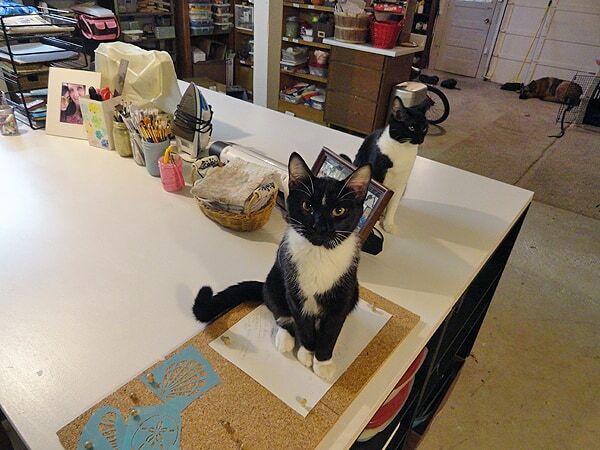 Because there are several layers, the chalkboard is actually a little raised off the table top. Plus the edges are a little ugly, so I cut strips of brown felt and created a frame, tacking it down using E6000 glue. I even made a little pocket at the bottom for some chalk. I used some flat marbles and scrapbook paper to create some magnets and put all my chalk in one jar and these cool chalk pens in another. 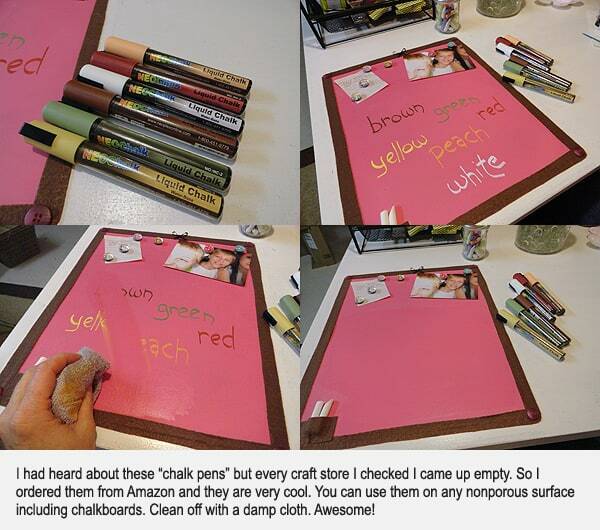 Speaking of these chalk pens, if you haven’t heard of them they are great for using on any non-porous surface like glass, dry erase boards and chalkboards. They wipe off with a damp cloth and come in several different colors. [amazon_link id=”B001BJNQFK” target=”_blank” container=”” container_class=”” ]I bought mine from Amazon[/amazon_link]. I’ve looked at Michael’s several times but haven’t been able to find any. Booties… Nala and Red in the background. I digress. So I also had this old shelf that someone threw away and I saved it from the curb. It’s been sitting and sitting and I wasn’t sure what to do with it. Then I hung it on the wall and it turned out to be the perfect shelf for my spray cans! Uhh. Yeah. That’s another cat. We have 6 all together. Crazy cat lady. No denying it. This actually isn’t that easy to take pictures of! Here’s an overhead shot. So there’s still a lot of work to be done as you can see from the mess laying around, but things are so much better and I have so much room to work now! This picture is from right after we finished building it, I’ve been using it now for well over a month and just absolutely LOVE this table. I want to thank my husband for building it for me. I love you honey! Yay me! If you want even more craft space inspiration? Check out how to make a DIY corkboard wall letter for your craft room! These corkboard letters would be great for a college dorm room, in a locker, in your kitchen, in your cubicle at work and of course in your office at home! Love the table, minus the cats! Don’t like cats. Going to try to do a few of your great ideas for my room. Thanks for the ideas. Hello!!! Where did you get the table top from? I am envious of all the space you have. You did a wonderful job! 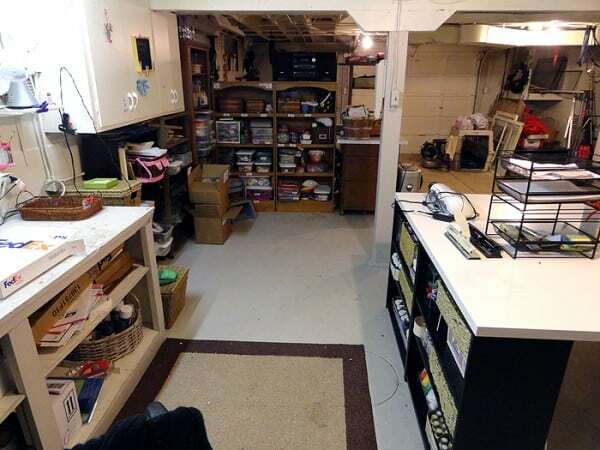 Hello… was looking up other craft rooms and even though the “new” looks are so fresh and pretty, I am like you: mine is in the basement and its not pretty, but I have TONS of room and can get plenty of people in my area and still move around. Mine supports 4 large/long tables and chairs for 8+ and crafts are: clay, paper goods, beading, leather, sewing, painting and wood working. I have a large tv for my shows and I also have a super stereo for dancing with my grandkids while crafting. I love the “magic’ that happens in a craft room, either by myself or with family or friends. Thank you for sharing your space. I would pick it over a new area any day. Thanks Rhonda, so nice of you to say! I love that you dance with your grandkids in your craft space, that is so FUN!! I my made the same table set up about six months ago for my glass studio. I love it! There is so much room for my big sheets of glass. I am another crazy cat lady of five with three dogs!! We have two great Pyrenees and a Mini Aussie Shepherd. Great job on your table. That’s awesome Cindy! I love mine too, so much room! Our basement used to look like that, especially the ceiling. We had friends over and gamed in the basement. It was embarrassing to us, although they didn’t really seem to mind. We wanted to redo it, but didn’t have the money, so we had to get creative. We built up the undersides of the joists with strips of cardboard, until the cardboard was flush with the bottom of the pipes. We were going to cover the cardboard with batting or thin slabs of foam, but they were expensive. We ended up using foam carpet underlayment/padding to soften it up, then upholstered with cheap white sheets from the thrift store and yard sales. We dyed the sheets a yellowish-almond color before we put them up. We painted the floor to look like stone tiles with deck paint and sealed it. We got some old kitchen cabinets from some people his brother knew who were remodeling for free. We put those in and painted everything to match. We built a false wall to hide the washer and dryer pipes, and along one side of the water heater. We hung more dyed sheets as curtains to hide most of the rest of the walls and in front of the water heater. Then we used some painted dividers made out of old doors by our gaming table. We hung up framed posters right on top of the curtains. You could do some of that yourself. Check Freecycle and Craigslist for free cabinets and shelves. Paint all your shelves and cabinets the same color for a more unified look. Put curtains over open shelves you want to hide. Upholster the ceiling, paint the floor. Keep the colors light so it doesn’t look cramped. You can make it quite cozy down there. What great ideas Susan! Thanks so much for sharing that, I really appreciate it! I absolutely LOVE your craft room. I too am in the basement. 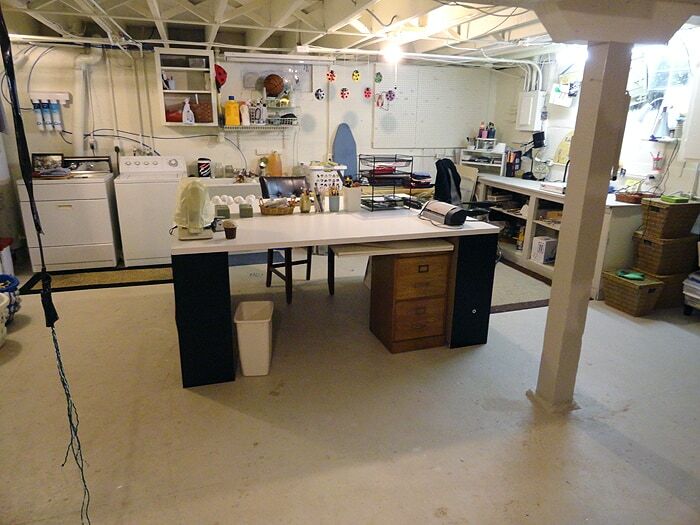 I will be using MANY of your ideas to help set up (what is now just a table and lots of piles) a working craft room. Thank you so much! Love your space! I found it on Pinterest. 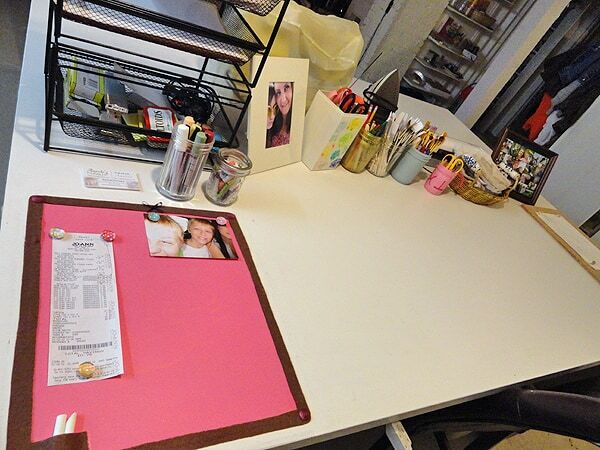 Your worktable looks great and so functional. Also, love the kitties. We only have 4, but add in the 3 small dogs and a parrot and I’ve got a menagerie! And they always want to be where I am, which is usually in my craft space. 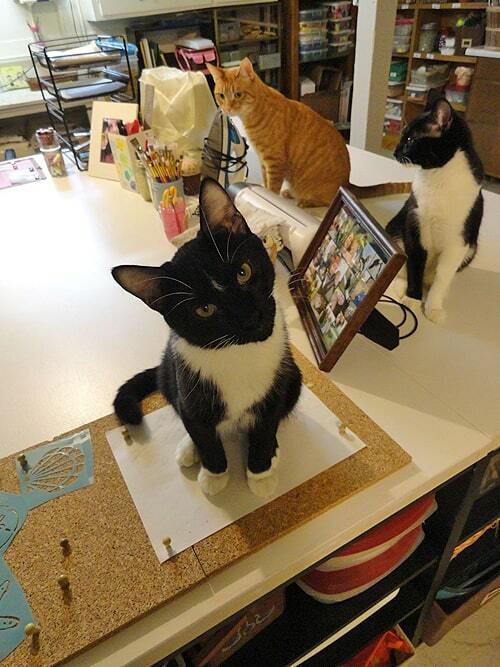 I feel the need to warn people receiving crafts from me that they’ll probably get some free cat hair, as I can’t seem to keep the kitties from jumping into my lap when I’m working. lol! It never occurred to me that it was a basement because we don’t have them here. Yours is so well lit (a MUST for me for any space), loved, and lived/created in. 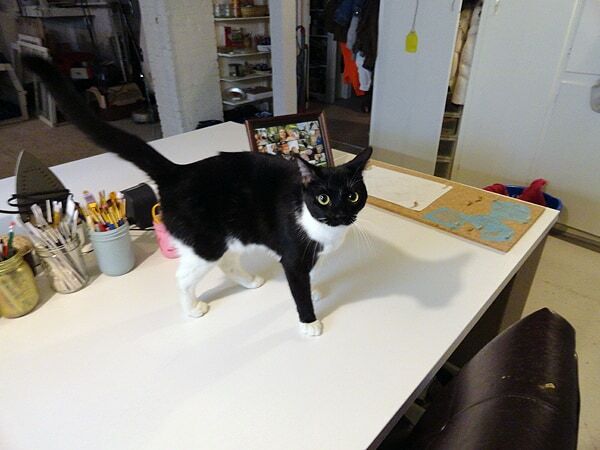 Thanks for sharing a REAL craft room, not a magazine photo shoot. It is TERRIFIC!!!!! Comment on your basement craft room. I think it looks great. the one you see in the magazine are ones no one actually does any thng in. Mine is actually in the basement also but I have no windows and a smaller space. Our basement is finshed. I have to share it with hubbys pool table and ( like ) family room area. So my space is not as big. Well only if you include the laundry and it is pettioned off from the rest. One more thing. If you have a mess you can just close the door and walk away. Thanks Rosemary! Kind of like a kitchen with no mess :) doesn’t seem lived it without it! just curious….what is the width of the door that you chose? 24 or 30 inches? This looks great! My craft space has been in the basement for awhile now. 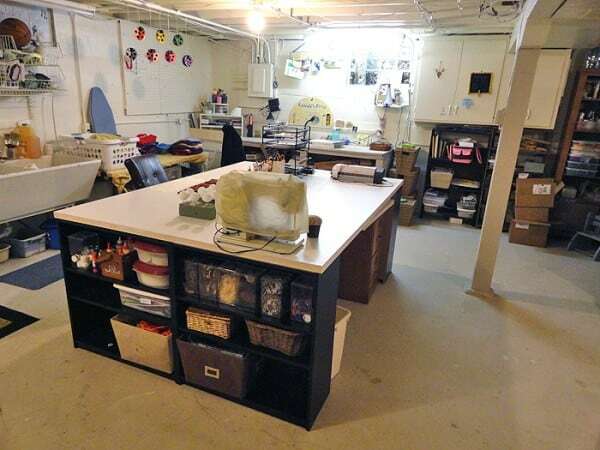 It always make me look at other people’s craft spaces so longingly. Hopefully, once our basement redo is complete, I can make a table like this! Also, I thought you might like to know (I realize you might already know it) that your pop up ad on your page is a political ad for a candidate. I don’t see much on your blog to indicate that you would want that, so I thought I would give you a heads up in case you didn’t want that. I adore that table and space. I live in an apartment that is less than 1000 sq. ft. My table is my kitchen table and my supplies are in cardboard boxes spread around the apartment. I am soooo jealous!!!! 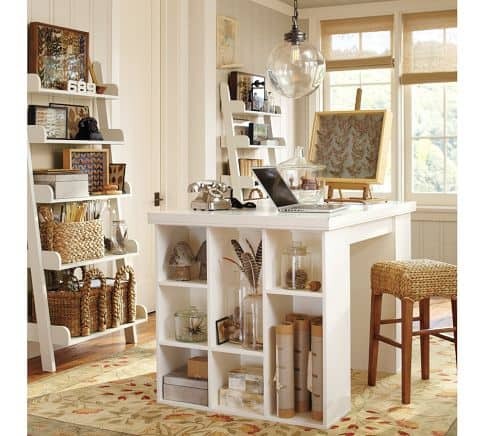 What a fantastic craft table and your space is wonderful! I LOVE IT! I just did a post about needing to have a project room and some inspiration photos! This table is a must! Thanks for sharing..came over from Tatertots and Jello..Have a great weekend! 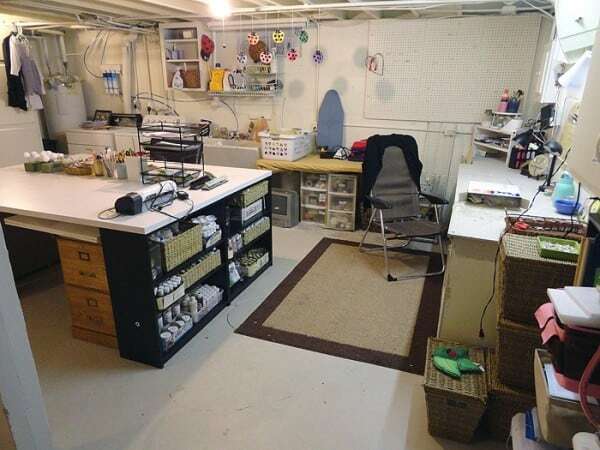 Oh, I think your craft room is just lovely. You did an excellent job and I would love to live by you and play in your room. 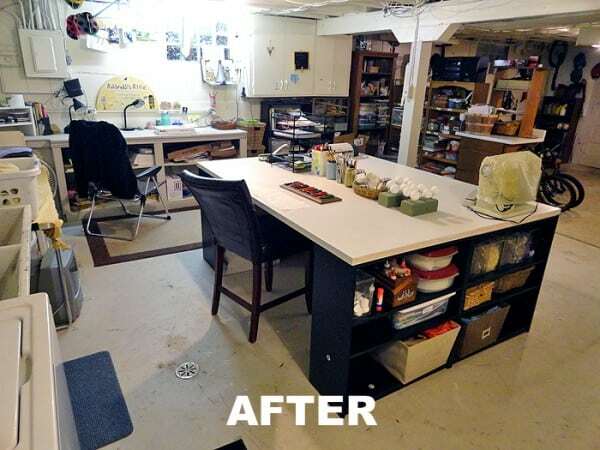 Wow Amanda, what a great space and I love that huge craft table you made. I can sure use them !!! Thanks for sharing. I saw that craft table on the Ivy Cottage also, but like you, I don’t have a dedicated room. You have given me inspiration for my basement. 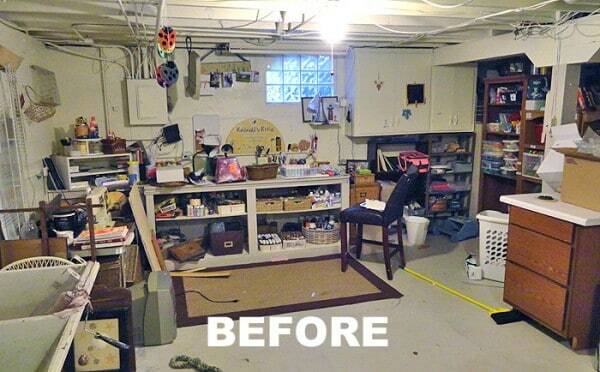 Your basement craft room is now on my list of things to do!!!! FANTASTIC table and space Amanda!! 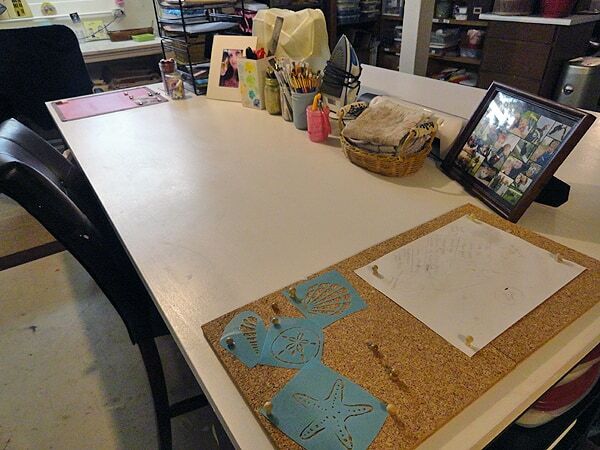 I have had this table pinned also and hope to make one for my “lovely” basement craft room also. Totally awesome! Must be so pleasant to go down there and work now. I love your kitties too. Amanda, It looks fabulous!! You did such a GREAT job!! Everything looks so organized and perfect. It makes me want to get in there and create something. Happy Crafting!! Love your space. I had pinned the original as well – and now yours. I too will be making a move to another room for my studio (sometime this year – I hope) so I’ve been pinning ideas as well. 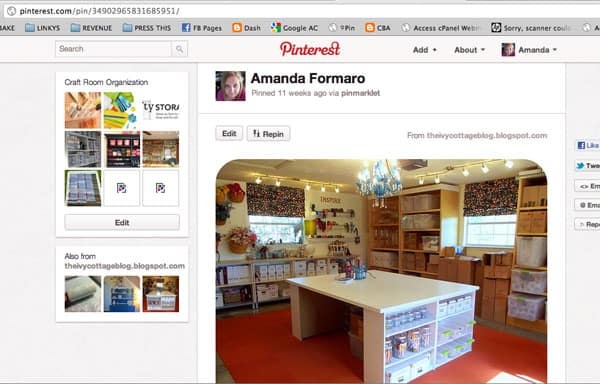 Thanks for sharing your pinterest board as I’ll be following it! Going to check it out now for more inspiration! Amanda, I love your new craft table! I liked the original one, too ;-) This is one of those ideas that I keep filed away in my head for the day when I, too, can have a craft room! It looks great!! I am in the midst of doing the same thing, My scraproom is in the basement as well. This looks great! I think I live right around the corner from you in TL. I am enjoying your blog.